One point that has become crystal clear in the recent discussion of the vaccine-autism war. The mainstream media, as a general rule, is not competent in its coverage of autism issues. The New York Times and the Globe & Mail (self promoted as "Canada's National Newspaper") have been brutally one-sided in their misrepresentation of vaccine-autism issues. They have largely abandoned their journalists' hats to promote the views of public health authorities and the vaccine industry. CNN's Campbell Brown has also weighed in with a largely ignorant, mostly bull and lots of bias, attack on those who express concerns about vaccine safety and autism disorders. Contrary to Brown's ill informed opinion there is evidence in support of a vaccine autism link. Science has not "decided" the issue. The question, according to at least 3 very senior and credible health authorities, doctors Healy, Gerberding and Alexander, is still very much open and should be studied further. On other autism issues Canada's CBC, the New Yorker, and many other major media outlets have pandered to the Neurodiversity movement's misrepresentation of autism and persons with autism. There have been exceptions. The Vancouver Sun did an excellent series, Faces of Autism, on the diversity of autism spectrum disorders and was not afraid to show and describe the realities of life for a severely autistic girl and her vamily. 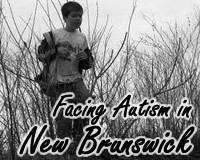 Faces of Autism, with its balanced, honest portrayl of autism was everything in terms of responsible journalism that the CBC's Positively Autistic series was not. Likewise CBS (and US News and World Report) have done some excellent work on the vaccine-autism war presenting the very learned, well informed views of Dr. Healy that the existing studies are not specific enough to address population subsets that might be more vulnerable to autism exposure. The reality today is that those actively informed about autism issues and seeking more perspective on autism issues are more likely to find them on the blogosphere. 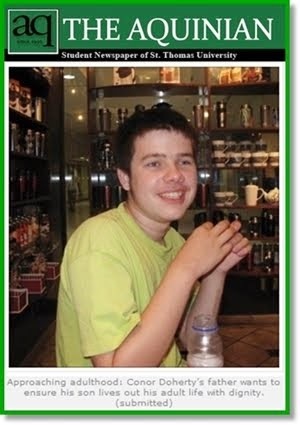 The Huffington Post has featured the autism vaccine issues on its Autism News page. It has provided an outlook for both sides of the debate, with David Kirby and Robert F. Kennedy featured on the same page as vaccine patent holder and industry spokesperson Dr Paul Offit. The Age of Autism is not as balanced as the Huffington Post but is an excellent site for information from the perspective of those who believe that vaccines cause or contribute to autism disorders. Informed, balanced blogs are now being written by academics and professionals interested in autism issues. One of my favorites is Autism Research Blog: Translating Autism authored by Nestor L. Lopez-Duran Ph.D. a clinical child psychologist and neuroscience researcher working at a large Midwest university-based child psychiatric institute. The Lovaas Institute and the Center for Autism and Related Disorders also have blogs. There are many fine parent blogs of which this blog is the best (just kidding). Many are listed on the side bar of this blog. There are also blogs by autistic persons, including Jonathan Mitchell's autism's gadfly and a blog by autistic artist Stephanie Lynn Keil. 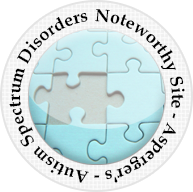 The Neurodiversity movement with its anti-treatment, anti-cure, social construct model of autism has many blogs including the neurodiversity page at change.org authored by Dora Raymaker and Kristina Chew and Kevin Leitch's LB/RB. The latter site can offer provocative discussion on important issues at times but often degenerates into smears, name calling and insults of those who do not share a neurodiversity perspective. About.com Autism by Lisa Jo Rudy is a corporate blog written by a parent who shares a neurodiversity perspective but tries honestly to present all sides of autism issues objectively and with impeccable courtesy. The mainstream corporate media really showed its colors with its grossly unbalanced reporting of the Autism Omnibus hearings jumping up and down in the air and declaring that science has spoken and that vaccines do not cause autism. The same media ignored the 2007 decision in Bank v HHS for which compensation was announced recently for a decision in which the Special Master accepted a claim that vaccines led to ADEM in a child which resulted in PDD-NOS, an autism spectrum disorder. The same corporate media, in announcing that vaccines did not cause autism also ignored the Poling case in which government acknowledged that vaccines caused "autism like" symptoms (autism currently is diagnosed by symptoms there being no accepted biological test). As stated above, the mainstream media largely ignored the views of former NIH head Dr. Bernadine Healy, recent CDC head Dr. Julie Gerberding and Dr. Duane Alexander an NIH agency head that more research on vaccine autism issues could and should be done preferring instead to regurgitate pejorative descriptions of parents who describe their own first hand observations of their children's regression after vaccine treatment. Autism reports in the mainstream media should be taken with a huge grain of salt not because of the existence of a conspiracy, although conspiracies a la Madoff and Enron do exist, but because of the widespread ignorance of many in the media and their increasingly ill informed, imbalanced, and unobjective journalism. Deanna Chieco, in the Johns Hopkins Newsletter, reports on a case study in which ECT, electro convulsive therapy, was used to treat a young autistic child who was incurring 109 self injurious incidents per hour. With ECT the self injurious behavior was reduced from 109 to 19 incidents per hour, permitting the child to be able to attend educational programs, behavioral therapies and family activities and thus dramatically improving the child's quality of life. This article and the study on which it reports should be must reads for parents of autistic children, neurodiversity ideologues, autism therapists and health care professionals and researchers. Reducing severe self injurious behavior should have no ideological component. Even Michelle Dawson, Ari Ne'eman and Estee Klar will have a difficult time arguing that dangerous, life restricting behaviors should not be reduced by treatment. President Barack Obama has requested $211 million as part of the Department of Health and Human Services budget for autism research and services. Let's hope a substantial portion of the research is directed towards environmental research, including possible vaccine causes, and for treatments. The "it's gotta be genetic model" of autism research funding identified by Teresa Binstock in 1999 has ignored the environmental component of autism causation referenced on several occasions by Simon Baron Cohen. The notion that this complex condition is entirely genetic was never evidence based. Hopefully President Obama will not let the IACC continue its shenanigans. Hopefully he will ensure that funding is set aside out for vaccine autism research as recommended by Dr. duane Alexander, Dr Bernadine Healy and Dr Julie Gerberding amongst others AND FOR ALL OTHER appropriate environmental autism research. The light in the window in the bottom pic is not the sun, it is the flash from my camera. 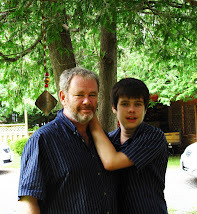 I am the father of a 13 year old boy diagnosed with Autistic Disorder assessed with profound developmental delays. I have never attributed his autistic disorder to vaccines or vaccine ingredients although I currently have an open mind on the subject. I was very disappointed with your opinion piece declaring that the vaccine autism debate should end now and that the science is clear. I submitted a comment on that piece listing some of the many pieces of information and evidence that you simply ignored in articulating your opinion. That comment was not accepted for publication by your moderators. "scientists must investigate susceptible subpopulations of children, including kids with mitochondrial disorders and those who have trouble metabolizing mercury." "One question (is) whether there is a subgroup in the population that, on a genetic basis, is more susceptible to some vaccine characteristic or component than most of the population, and may develop an ASD in response to something about vaccination. We know that genetic variations exist that cause adverse reactions to specific foods, medications, or anesthetic agents. It is legitimate to ask whether a similar situation may exist for vaccines,"
As you probably know a decision of the US Vaccine Court was released since your opinion was expressed decreeing an end to vaccine autism debates. 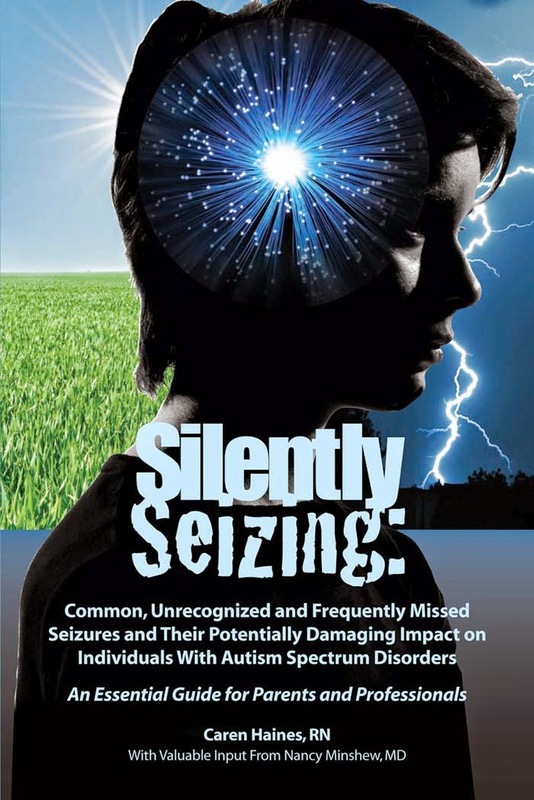 In Banks v HHS the Special Master accepted the plaintiff's claim that as a result of the MMR vaccination received on 14 March 2000, his child suffered a seizure and Acute Disseminated Encephalomyelitis (“ADEM”) which led to Pervasive Developmental Delay (one of the autism spectrum disorders), a condition from which he continues to suffer. I am sure you are aware of the Poling case in which the government acknowledged that vaccine caused the child's 'autism like symptoms". Autism as you may know is defined entirely by symptoms. CBS has reported that more than 1320 vaccine cases alleging brain injury, some including autism disorders, have resulted in government settlements. I ask that the Globe and Mail, and you personally, exercise some journalistic balance, and inform the Canadian public, that the Vaccine Autism debate is, contrary to your previous opinion, far from over. Nor does the science make clear your claim that there is no vaccine autism connection. Three senior members of the American public health authority establishment have lent there voices to those of thousands of parents and many health care professionals who want to see the necessary research done to explore these issues. Research, not the opinion of Andre Picard or the Globe and Mail, will provide the information that will help children, whatever the results of the research. NOTE: As subsequently pointed out by jypsy, the Banks decision itself was made public some time ago and commented on by some involved in autism discussions. The compensation awarded to the injured child was announced last week for that decision. Vaccine-Autism War: Where In The World Is Dr. Paul Offit? "It's a great day for science, it's a great day for America's children when the court rules in favor of science." Now another Vaccine Court decision has been made public and .... ooooops ... the Special Master in the case of 2007 Banks v. HHS has ruled in favor of the Plaintiff who claimed that as a result of the MMR vaccination received on 14 March 2000, his child suffered a seizure and Acute Disseminated Encephalomyelitis (“ADEM”) which led to Pervasive Developmental Delay (one of the autism spectrum disorders), a condition from which he continues to suffer. The decision is available in pdf and is discussed in some detail by David Kirby and Robert Kennedy at the Huffington Post. Will Dr. Paul Offit appear before the cameras and reporters to once again declare a victory for science or will his love for the Vaccine Court wane with a victory for an injured child over the government and the vaccine industry? And how about Andre Picard of the Globe and Mail who removed his journalist's hat and decreed that the debate about vaccines and autism should end? Should the all knowing Andre Picard lose his god like status and be ordered to rejoin the ranks of ordinary citizens who exercise their freedom of expression to discuss public health issues? Or are some Vaccine Court decisions better than others? Today people around the world are wearing pink as part of a World Wide anti-bullying day. Bullying is a very serious problem that was not always taken seriously. As an "army brat" who moved often, 6 schools in 3 provinces for grade school, 3 different schools in 2 different provinces just in grade 2, I saw lots of bullying during an era when few adults paid attention to the problem. Today, as bullying takes on new forms with young people being bullied severely on the internet through "social media" and while old forms of bullying persist, including name calling and physical assault, people are starting to take bullying seriously. "rallied around a younger student after he was bullied for wearing a pink polo shirt on the first day of school. David Shepherd and Travis Price, who were in Grade 12 at Central Kings Rural High School, asked all students at their school to wear pink T-shirts to combat bullying. They bought 50 pink shirts from a discount store, then e-mailed classmates to get them on board. The next day, hundreds of students showed up wearing pink clothing. Before long, the movement had spread around the province and across the country." I am very proud of the students from Central Kings for the stand they took. And I have tremendous respect for every one who stands up for those who are bullied, usually for being different, for wearing different clothes, for their sexual orientation, for their racial or ethnic background, because they have a disability ... in some cases because they are autistic. In some cases people are bullied because they are the parents of an autistic child fighting for services for their child or simply trying to include him or her in an every day life occurrence like attending a movie theater. These are just some of my personal connections to the bullying phenomenon. Many people have been bullied in life for many different reasons including at school and in the workplace. It is time to end bullying in all its forms and wherever it occurs. And to say thank you to everyone who helps to end bullying. Corrrection: This comment initially, and incorrectly, identified Professor Michael Fitzgerald as being the author of Defining Autism – a damaging delusion, instead of Dr. Mike Fitzpatrick. Thank you to Mike Stanton for the correction. This comment has now been corrected and modified accordingly. It is Topsy Turvy Day in an Irish Times article Darwin is the origin of new thesis on Asperger's. In "Darwin" Dr. Muiris Houston promotes the latest effort by Professor Michael Fitzgerald to assign yet another historical genius, this time Charles Darwin, to his speculative list of persons with Aspergers. Dr. Houston glosses over entirely the fact that Professor Fitgerald's opinion is pure speculation, having never met Darwin who died before Asperger's was even defined as a medical condition. Nor does Dr. Houston mention Professor Fitzgerald's career of assigning many historical geniuses to his speculative Asperger's list. Parents once again are the villains in Dr. Houston's and Professor Fitzgerald's Topsy Turvy fantasy production. Michael Fitzgerald, of the Department of Child Psychiatry at Trinity College, Dublin, has speculated about historical figures with autism in numerous journal papers and at least three books: The Genesis of Artistic Creativity: Asperger's Syndrome and the Arts, Unstoppable Brilliance: Irish Geniuses and Asperger's Syndrome and Autism and Creativity, Is there a link between autism in men and exceptional ability? Writers – Hans Christian Andersen, Lewis Carroll, Bruce Chatwin, Arthur Conan Doyle, Herman Melville, George Orwell, Jonathan Swift and William Butler Yeats. Philosophers – A.J. Ayer, Baruch de Spinoza, Immanuel Kant and Simone Weil. Musicians – Bela Bartok, Ludwig van Beethoven, Bob Dylan, Glenn Gould, Wolfgang Amadeus Mozart and Erik Satie. Painters – Vincent van Gogh, L.S. Lowry, Jack B. Yeats and Andy Warhol. Unstoppable Brilliance discusses Daisy Bates, Samuel Beckett, Robert Boyle, Eamon de Valera, Robert Emmet, William Rowan Hamilton, James Joyce, Padraig Pearse and W.B. Yeats. Autism and Creativity says the following may have been autistic: Lewis Carroll, Eamon de Valera, Sir Keith Joseph, Ramanujan, Ludwig Wittgenstein and W.B. Yeats. While Professor Fitzgerald visits history, and his imagination, to speculate about historical figures he never met, most of whom lived and died before autism and Asperger's were known to the world, parents in the real world today struggle with the real challenges of caring for, raising and preparing their autistic children for a future without them. And he says that some parents implicitly dehumanise people with autism by describing “their own predicament in terms of grief and loss and as one of unremitting battle against the corrosive impact of autism on their child, their marital relationship and their wider family”. Dr. Houston then goes on to point out that there is no scientific evidence, only anecdotal evidence, in support of biomedical treatments. And therein lies the rub. Dr. Houston and the Irish Times reject anecdotal evidence, direct observation by parents of their children, of real situations and people, as being unscientific. 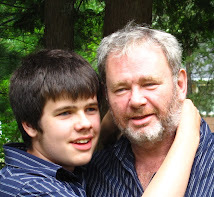 Yet, he embraces, without question, the historical speculation of Professor Fitzgerald that Darwin, and other historical geniuses, people that Professor Fitzgerald never met, most of whom died before autism or Aspergers were recognized conditions, had one of these disorders. Parents who actually care for and raise their children, who can see the realities of their children's autism spectrum disorders, and who try to help them live the fullest life possible are increasingly under attack today. Medical authorities fiercely intent on protecting vaccine programs from ANY criticism or question dismiss as hysterical parents who see their children regress after receiving vaccines. Parents who provide ABA or biomedical treatments to help their children are accused of oppressing them by some neurodiversity advocates. Professor Fitzgerald has built a career writing articles and books and making presentations to learned societies speculating about the possibility that people he has never met might have had either autism or Aspergers. Dr. Mike Fitzpatrick, himself the parent of an autistic child, has the incredible arrogance to to demean and dismiss parents who fight for their children, who struggle to care for them every day. He speculates, with no solid evidence, that parents efforts to help their own children has a corrosive impact on autistic people. Describing our children's realities as we see them every day is actually harmful? Meanwhile Professor Fitzgerald sits in the library imagining that Darwin had Aspergers. Dr. Muiris and the Irish Times embrace both of their evidence bare theories while dismissing the daily observations of parents from around around the world. Conor's school day includes ABA based academic instruction. Contrary to those with very little actual knowledge of, or real involvement with, ABA it is not oppressive and does not turn autistic children into robots. 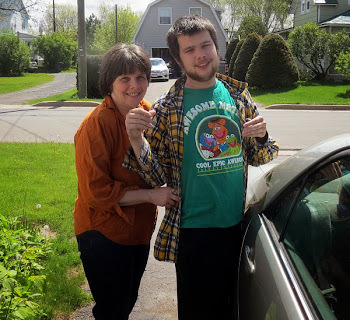 Conor looks forward to visits at home from ABA therapists and going to school where he receives ABA. In the picture above Conor set his lunch bag in front of the door before going to bed last night, a sure sign he was eager to get to school where educators impose what Michelle Dawson, Estee Klar, and other anti-ABA activists, would call "oppressive" ABA. As the lunch bag shows Conor does not share their opinion of ABA. And he has a lot more actual experience with ABA than Ms Dawson or Ms Klar. Unfortunately there was no school today. It was another snow day in Fredericton with police warning people to stay off the roads. Dad has to grab a shovel and tackle some of the snow. Weather permitting, Conor will be glad to get back to school tomorrow. Autistic Disorder is a disorder. In the pictures above Conor, who has Autistic Disorder, exhibits some of the behavior which, in the real world, if not in the ideological world of Neurodiversity and ASAN advocates, is a deficit. 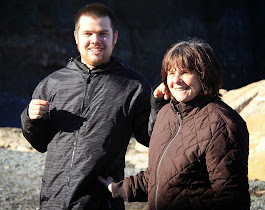 Conor has throughout his life enjoyed visits with Grammy and Grampy in Nova Scotia, and with his Nanny in nearby Douglas, New Brunswick. In the past couple of years though Conor, while asking to visit Grammy and Grampy and Nanny, usually has great difficulty once he arrives. He gets overexcited and withdraws; closing his eyes and plugging his ears. In the sometimes topsy turvy world of autism discussions debates rage on over such inane issues as whether autism is in fact a medical disorder or a socially created construct of an intolerant society. As the parent of a 13 year old boy with Autistic Disorder I think the social model of autism is pure, unadulterated nonsense. In the pictures above Conor, who loves his Nanny, covers his ears and curls up with Dad for comfort during a visit to Nanny's this past weekened. The occasion was a visit by his uncle Bill and cousin Ben from Nova Scotia. Conor's Mom stayed for several hours but I took Conor home after 15 minutes because of his discomfort. 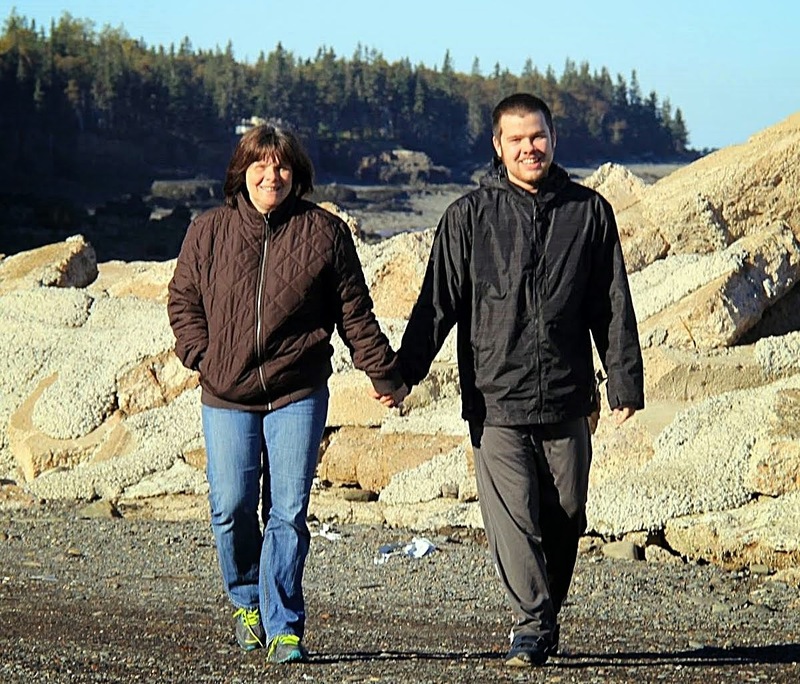 Conor's autistic disorder prevented him from spending time with family members whose company he has enjoyed in the past. 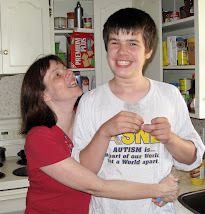 For me, and for Conor, autistic disorder is a real disorder not a social construct. their well funded ways, such institutions and individuals strongly resist change"
No medical model is anymore entrenched then the vaccine model of public safety. And few spokespersons are better funded than vaccine patent holder Dr. Paul Offit who has been on a never ending tour promoting his book about what he calls autism's false prophets. There are a number of indisputable good reasons for the entrenchment of the vaccine model: the reduction and near elimination of serious diseases, some of which can kill, are very powerful reasons in support of public vaccination programs. But few systems or models are perfect. Most require adjustment when problems are found. If vaccines do cause harm in some cases then those harmful, and potentially harmful, effects should be studied and adjustments made. Unfortunately the vaccine programs have been elevated to a sacred level by public health authorities to such an extent that people who ask questions or voice concerns are dismissed as hysterical, as cranks, quacks, charlatans and any number of other pejoratives. Dr. Wakefield has been the subject of an ongoing investigation by the GMC for several years. Journalist Brian Deer who has had some serious involvement with the laying of charges against Dr. Wakefield has recently published an article in the Sunday Times in which he "convicted" Dr. Wakefield of data tampering. Other imperious journalists like Andre Picard at the Globe and Mail have decreed that the debate over vaccine safety must end now. Imagine, a journalist dictating that free public discussion of public safety issues must end now? Of course THE primary spokesperson for the entrenched medical model, the entrenched "speak no evil of vaccines model" is Dr. Paul Offit. Dr. Offit is the vaccine patent holder whose genial face, cozy sweaters and "regular guy" flannel shirts appear every other day in a major media interview describing his own heroics on behalf of the children of the world and demonizing the evil parents who have voiced their concerns about vaccines thereby contributing to the growth of disease and death. The Institute of Medicine (IOM) Immunization Safety Review: Vaccines and Autism (2004) proved Ms Binstock's hunch to be correct when it expressly discouraged further investigation of vaccine safety. Last month the Interagency Autism Coordinating Committee (IACC) confirmed her hunch as prophecy when it reversed its own decision reached only weeks earlier to authorize funding for research of vaccine-autism connections, research that might have provided the kind of evidence found to be non-existent in the recent Vaccine Court Autism Trilogy. As Teresa Binstock predicted in 1999 any research of non-genetic causes of autism, including and especially, potential vaccine causes, will have to come from outside the public health establishment. Of course the ability to conduct such research will be further hampered by well orchestrated media campaigns led by Dr. Paul Offit with journalists from institutions like the Sunday Times, the New York Times and the Globe and Mail scurrying about helping to suppress public discussion of concerns which raise any doubts about the deeply entrenched vaccine health model. Personally it is the suppression of research and public discussion which causes me the greatest concern about the safety of vaccine programs. Ultimately, as the Semmelweis case reviewed by Teresa Binstock shows, the truth will out. In the meantime though some vulnerable children might be harmed by vaccines and vaccine ingredients. harm that might have been avoided with some adjustments. The vaccine program itself will most definitely be harmed by the campaign to suppress research and discussion of vaccine safety concerns. Vaccine-Autism War: WHY Won't They Do The Research? Apart from the many thousands of allegedly hysterical, delusional parents and allegedly fraudulent, huckster professionals who have raised safety concerns, particularly autism concerns, about vaccines two high ranking members of the American public health system have stated a need for more research of possible vaccine-autism connections. Dr. Julie Gerberding, former head of the CDC and Dr. Bernadine Healy, former head of the NIH and the American Red Cross have BOTH indicated that more research of vaccine-autism issues COULD and SHOULD be done. So WHY are public health authorities like the Interagency Autism Coordinating Committee REFUSING to authorize funding to research possible vaccine-autism connections? The science proving this point has been quite clear for a number of years. That's because a whole industry of hucksters has sprung up to promote alternatives to vaccines, and the vocal (and Web-savvy) minority of conspiracy theorists will see these thorough, thoughtful rulings as, well, just another part of the conspiracy by Big Pharma to poison kids for profit. (FDA Website: "Thimerosal has been removed from or reduced to trace amounts in all vaccines routinely recommended for children 6 years of age and younger, with the exception of inactivated influenza vaccine"). I also put on the record for the Globe and Mail, in my rejected comment submission, that I am the parent of a 13 year old autistic boy who has never attributed his autism to vaccines. I have changed my mind from the belief that a vaccine-autism connection has been disproved to being undecided. I am undecided because of the facts set out above. If Andre Picard and the Globe and Mail wish to dismiss me as a conspiracy theorist fine but they should rebut the facts that I have set out in this comment or show that my reasoning in relation to those facts is flawed. Of course they can use their bully pulpit to issue Picardian decrees about vaccine safety and simply ignore facts and reason. And they can still continue to pretend to be journalists while they are at it. It was also a day Dad visited the school gym to see Conor having some fun. Education Aide Brad Daniels does excellent work with Conor, in the study room, and in the gym. In these two videos Conor is shooting baskets and shooting on the net with Brad as the goalie. If you play these videos you will hear a very loud echo and lots of childrens' voices. Conor can be upset by sounds but he has adjusted very well to the echos and noises in the gym. I recorded these videos in short clips with care to avoid recording any other children but there were many other students running by and playing various sports in the large fieldhouse gym. I could see Conor paying attention to the activities of the other children and asked Brad about Conor's interest in them. Brad also informed me that the other kids show interest in Conor and ask him to join them on occasion. In addition to the gym where Conor goes daily he gets to swim in the school's Olympic size swimming pool twice a week. 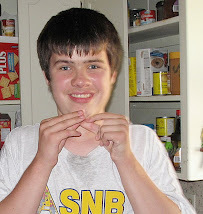 Conor is very fortunate to attend Nashwaaksis Middle School in Fredericton. It has outstanding physical ... and human resources. 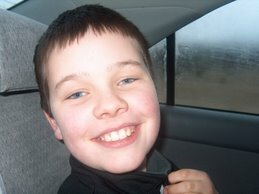 Today is Conor's 13th Birthday! As on any birthday there is a birthday cake (and icing) to be eaten! Good Grief! Now Darwin Was Autistic? Give It A Rest! As a parent of a boy with autistic disorder, assessed with profound developmental delays, and focused on the real life challenges of helping my son, I get tired of the endless speculation that attributes to every historical genius a diagnosis of Aspergers or Autism. Einstein is the most oft mentioned. Now a psychiatrist, Dr. Michael Fitzgerald is is presenting to the Royal College of Psychiatrists' Faculty of Academic Psychiatry his speculation that Charles Darwin was autistic or at least that he had Aspergers. Perhaps psychiatrists like Dr. Fitzgerald would have more time to actually help autistic children and adults if they just went through the history books and claimed that every historical genius known to humankind was autistic or had Aspergers. Then they could close off the discussion before anyone started speculating about whether history's brutual tyrants and serial killers might also have been autistic. In Unvaccinated Children Madness J.B. Handley at the Age of Autism focuses on the failure by government and public health authorities to conduct studies of unvaccinated children. He illustrates clearly , using the words of prominent health authorities and vaccine defenders, the research that should be done and the failure by those same vaccine defenders to provide a coherent rationalizaton for the failure to do research involving unvaccinated children to see if there are differences in autism rates from groups of vaccinated children. The story line sold by vaccine program defenders to the public is that concerns about vaccines causing autism are perpetrated by irrational, hysterical parents whose observations of the timing of autism onset after vaccinations can not be trusted. Doctors and researchers who question vaccine safety are quacks. The story line continues by promoting vaccine supporters including vaccine patent holder Dr. Paul Offit as spokespersons for true science. and defenders of public health and safety. The story line sold by vaccine program defenders omits any reference to settlements reached over the years with families of children injured by vaccines. The story line omits any reference to the active suppression of research that might determine the issues surrounding vaccines and autism. Handley's article provides some stunning comments from leading vaccine defenders Dr. Paul Offit and Dr. Julie Gerberding. The first is found in Dr. Gerberding's response to Dan Olmsted's question: Has the government ever looked at the autism rate in an unvaccinated U.S. population, and if not, why not? I think those kind of studies could be done and should be done. No studies have compared the incidence of autism in vaccinated, unvaccinated, or alternatively vaccinated children (i.e., schedules that spread out vaccines, avoid combination vaccines, or include only select vaccines). These studies would be difficult to perform because of the likely differences among these 3 groups in health care seeking behavior and the ethics of experimentally studying children who have not received vaccines." If there already exist increasingly large pools of children who are not vaccinated Dr. Offit's ethical rationalization for refusing to do studies that could actually explore possible vaccine-autism connections makes no sense. As for the difficulty of conducting such studies, SO WHAT? 1 in 150 children are estimated to have an autism spectrum disorder. Surely, that is a serious subject worthy of study even if it involves "some difficulty"? I can understand vaccine patent holder Dr. Paul Offit not having the energy and inclination to be involved in such studies but what about other researchers and what about the Interagency Autism Coordinating Committee? Why haven't they authorized funding for such studies even if they are "difficult"? When important research of the issue is not done, and is in fact discouraged, it becomes increasingly difficult to believe that public health authorities really want to fully study possible vaccine-autism connections. It seems increasingly clear they do not want to know if such connections exist and more importantly they do not want the world to know . 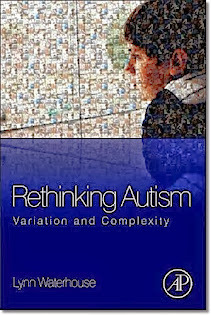 As Teresa Binstock reported in 1999 public health authorities would rather push the "its gotta be genetic" model of autism. Those kinds of studies could be done and should be done. One point is crystal clear in the vaccine-autism war. Dr. Paul Offit has media access and he isn't afraid to use it. Dr. Offit's "Autism's False Prophets" book was given free press in an article by Donald G. McNeil Jr. in the New York Times on January 13, 2009 - just prior to the Interagency Autism Coordinating Committee's clandestine decision to reverse itself and withdraw approval of funding of research that might have shown the existence of the vaccine-autism connection. Now, on the heals of the Vaccine Court's Autism Triology Dr. Offit is at it again with his Autism's False Prophets book and his heroic struggle to save children around the world from desperate anti-vax parents promoted in a prominent feature by Maggie Fox, Health and Science Editor, Reuters UK. Dr. Paul Offit's brown plaid shirt from the NYT interview is replaced with a comfortable blue sweater in the Reuters feature. Parents concerned about possible negative health impacts of vaccines are once again portrayed as desperate and irrational. Deaths of some children are blamed on such parents by Dr. Paul Offit in this article. There is no mention of the fact that "the government has paid more than 1,300 brain injury claims in vaccine court since 1988, but is not studying those cases or tracking how many of them resulted in autism". There is no mention of the fact that "the medical literature is replete with reports of neurological reactions to vaccines, such as mood changes, seizures, brain inflammation, and swelling." There is no mention of the fact that all the studies relied upon by Dr. Offit are epidemiological studies. There is no mention of the fact that Dr. Bernadine Healy, former NIH head has twice within the past year pointed out the limitations of epidemiological studies in exploring the possible impact of vaccines on susceptible population subsets of children. There is no mention of the fact that expecting women have received vaccines containing thimerosal, a mercury based preservative which crosses the placenta. There is no mention of the fact that some vaccines still contain "trace" amounts of thimerosal (FDA Website: "Thimerosal has been removed from or reduced to trace amounts in all vaccines routinely recommended for children 6 years of age and younger, with the exception of inactivated influenza vaccine"). No mention is made of an admission by Dr. Julie Gerberding, then CDC director, in an interview with Dr. Gupta, speaking of vaccination that "if you're predisposed with the mitochondrial disorder, it can certainly set off some damage. 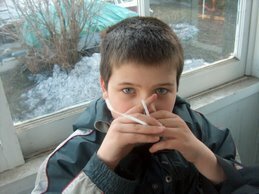 Some of the symptoms can be symptoms that have characteristics of autism." Dr. Offit does not mention in this latest opinion piece that public health authorities have for many years actively and expressly discouraged research that might prove a vaccine-autism connection and he does not mention that his latest media offensive is timed in conjunction with the IACC decision to cancel its previous approval of funding for such research and the release of the Vaccine Court Autism decisions. Comfortable plaid shirts and blue sweaters or not, I just can't trust a public health spokesperson who does not tell all sides of the story, who demeans parents raising legitimate concerns about their children's health and safety, who ignores credible criticisms and concerns about vaccine safety by doctors and scientists, and who hides the fact that public health authorities have actively discouraged and suppressed the research that could provide more objective answers. And of course the same spokesperson is tied by patent and profit to the promotion of vaccines. The world will continue to hear Dr. Paul Offit promoting vaccines. We will hear him over and over and over again. Those who are already convinced will remain convinced. Those who doubt vaccine safety, or have an open mind on the subject, will remain unpersuaded by such an unrelenting but clumsy public relations offensive. It is time for the relevant authorities to do the necessary research of possible vaccine-autism connections. The research will hopefully address the concerns of parents and professionals. Dr. Offit's unrelenting, and at times offensive, opinion campaign will not.